What to do on a cold, wet, windy November day? Well, you could take a trip back in time to the Battle of Britain or the post-war golden age of aviation. 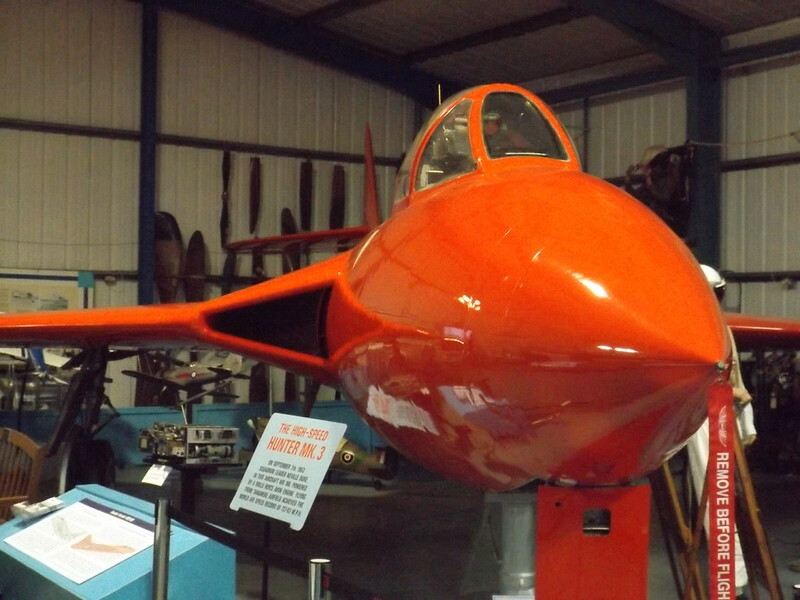 Once a frontline RAF base and home of the world airspeed record, the Tangmere Military Aviation Museum is situated just outside Chichester off the A27. Admission is currently £9.00 for adults, £3.00 for children, £7.00 for seniors and a family ticket (two adults, two children) £21.00. There are also discounted rates for service personnel and groups – see the website for more information. On arrival, one of the museum’s friendly volunteers furnished me with a map and briefly explained the layout. The museum is organised into a number of halls plus NAAFI cafeteria, memorial garden and outside exhibits. Ask at reception to book your ride in the English Electric flight simulator. I started my tour in the Battle of Britain Hall, which contains a large collection of artefacts, documents, photographs and paintings. The hall is somewhat dominated by the excavated remains of Sergeant Dennis Noble’s Hawker Hurricane fighter. You can listen to a recording of James Nicolson, the only RAF fighter pilot to win the Victoria Cross during World War Two, tell his story. Moving onto Middle Hall, you will find a varied collection of items including a chunk of the Mohne Dam, famously breached by the Lancaster bombers of 617 Squadron (Dambusters) back in 1943. Making your way back towards the main reception area, you enter Merston Hall, which houses two world airspeed record holding aircraft. In 1946, Edward Donaldson clocked up 615.78mph in the Gloster Meteor. In 1953, Neville Duke achieved 727.6mph in the bright red Hawker Hunter. The Merston Hall also contains a Supermarine Swift, Canberra cockpit, replica Spitfire prototype and Hawker Hurricane. Next door, in the Meryl Hansed Memorial Hall you will find an English Electric Lightning and Mk 5 Hawker Hunter. The Tangmere Hall, as the name suggests, tells the story of the airfield from 1917 to 1970. There are exhibits on the SOE (Special Operations Executive) and Lysanders that delivered agents into occupied Europe, the Royal Flying Corps (forerunner of the RAF), Bomber Command, Womens’ Auxiliary Air Force (WAAF) and Air Transport Auxiliary (ATA). The abysmal November weather meant that I didn’t get a chance to tour the memorial garden or air raid shelter. Outside, you will find a McDonnell Douglas Phantom, a couple of Harriers, a de Havilland Sea Vixen, Lockheed T-33A, Gloster Meteor and a Westland Wessex helicopter. In the covered shed, currently being restored, is a de Havilland Vampire. Additional facilities include a small military aviation library and Neville Duke Hall, available for group lunches. The museum is a charitable trust, staffed by a dedicated group of volunteers. During my visit, I noticed one of the volunteers taking a group of Scouts around the museum. Each time the volunteer asked the group a question, a sullen chorus of “Don’t know” was the response. The Scouts reminded me of Harry Enfield’s sulky comedy creations, Kevin and Perry. These gloomy, apathetic children made me bristle. However, I guess all they saw were the dusty ghosts of a lost generation, and ruins of a once mighty aircraft industry. To be honest, I don’t envy them. After all, they have inherited a country that has been in terminal decline since the war. Let us hope, the lessons of our history can still inspire them to build something better. Many thanks for visiting The War Years blog. Please leave your comments and don’t forget to share this post on social media.